The water was going to reach their home. The torrential rains in southern Mozambique had overflowed the Limpopo River, and much of the region was feeling the effects. Ivone Machaiele, her husband, and her five children had just finished eating dinner when they received the message that the nearby town of Chokwe had started flooding. They ran to the canal by their small, tin roof home and saw the water was gushing over. GiveMachaiele’s family tried to stow some of their belongings in safe areas before fleeing to the nearest road. There, they waited with their livestock for transportation to Hokwe, the nearest displacement camp. HELPING FLOOD VICTIMS: Samaritan’s Purse provided clean water and other aid after heavy rains created catastrophic conditions. Hokwe was an unofficial camp consisting of around 8,000 people spread out across eight schools. There were only three latrines and one well to serve the entire area. The Machaieles squeezed into one of the schools with hundreds of other people. For four days, they lived in close quarters as the water continued to lap around the region. “The most difficult part was the number of people that were around us, and it just created many difficulties there as well because of the amount of people and the lack of resources,” Machaiele said. After the fourth day, the family decided to return to their home to assess the situation. When they arrived, they found standing water inside in the house. The dirt floor and the area outside was squishy with mud. They realized their house still was not livable, but they couldn’t return to the camp. Machaiele and her family moved into a neighbor’s home that was less damaged. The neighbor didn’t have extra room or necessities, but she was able to provide a roof. More than a month later, the water is still standing in the Machaieles’ home. Worst of all, they have no possessions left. 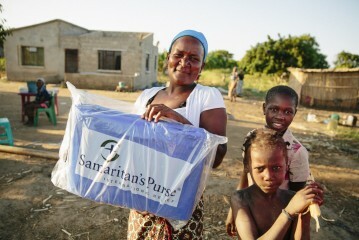 Samaritan’s Purse approached the leaders in Machaiele’s community to get a list of people who needed help. Machaiele’s family was put on the list, along with hundreds of others. The family received a tarp, blankets, and a bucket full of water treatment solution, mosquito nets, and other necessary items. One of the Christian leaders in the area, Agostino Chipanga, was also affected by the flooding. He was excited to see Samaritan’s Purse in his community, and he immediately saw that the importance of the work extended beyond physical relief. 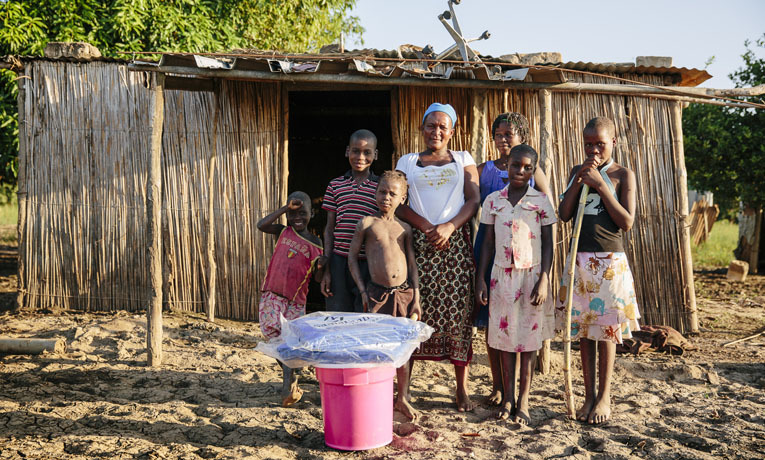 After the distribution, Machaiele carried the bucket and tarps on her head down a narrow dirt path to her home. She met her children along the path, and they followed her home. Everyone wanted to hold the items. Although their home still has a bit of water in it, they can now sleep comfortably and begin to get back to their normal lives. “Even these small things have helped so much and given us so much hope,” she said. As Samaritan’s Purse left the community, it was obvious that the work is far from complete. Recovery will take many months. As efforts move from relief to recovery in Mozambique, our staff on the ground and people who are still displaced need prayers and support.